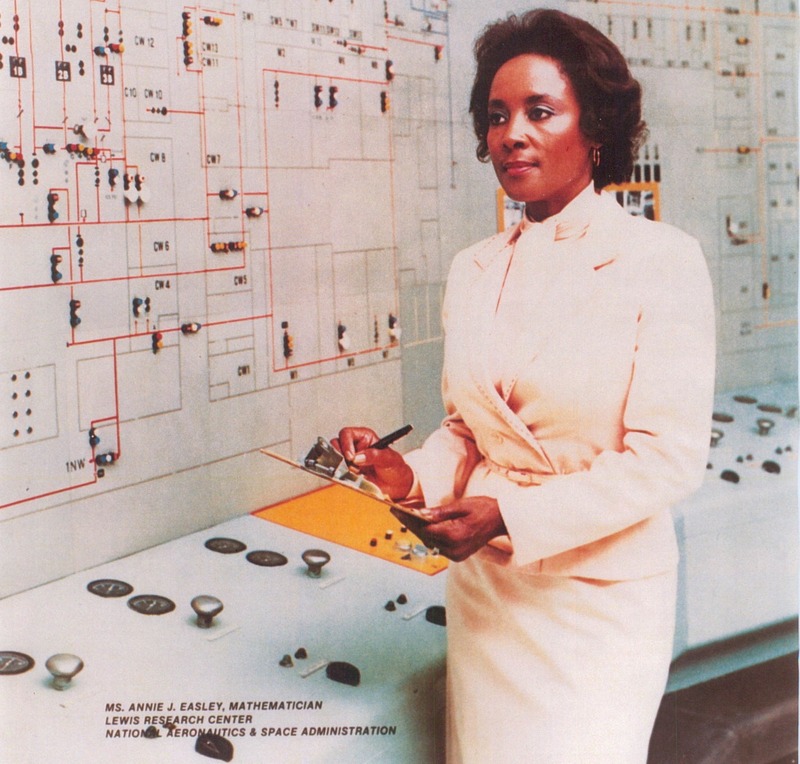 Annie Easley – computer scientist, mathematician, and rocket scientist – African American History Month 2015 #BlackHistoryMonth « Adafruit Industries – Makers, hackers, artists, designers and engineers! African-American computer scientist, mathematician, and rocket scientist… She worked for the Lewis Research Center of the National Aeronautics and Space Administration (NASA) and its predecessor, the National Advisory Committee for Aeronautics (NACA). She was a leading member of the team which developed software for the Centaur rocket stage and one of the first African-Americans in her field. Her 34-year career included developing and implementing computer code that analyzed alternative power technologies, supported Centaur, determined solar, wind and energy projects, identified energy conversion systems and alternative systems to solve energy problems. Her energy assignments included studies to determine the life use of storage batteries, such as those used in electric utility vehicles. Her computer applications have been used to identify energy conversion systems that offer the improvement over commercially available technologies. Easley’s work with the Centaur project helped as technological foundations for the space shuttle launches and launches of communication, military and weather satellites. Her work contributed to the 1997 flight to Saturn of the Cassini probe, which was launched by the Centaur. Annie Easley was interviewed in Cleveland, on August 21, 2001 by Sandra Johnson. The interview is stored in the National Aeronautics and Space Administration Johnson Space Center Oral History Program. The 55 page interview transcript includes material on the history of the Civil Rights Movement, Glenn Research Center, Johnson Space Center, space flight, and the contribution of women to space flight – Wikipedia. NASA Headquarters Oral History Project Edited Oral History Transcript & PDF. Annie Easley helped make modern spaceflight possible.